One of the greatest Red Sox players and one of the most clutch playoff performer of all time, David Ortiz is retiring. Everyone in Red Sox Nation loves him as they should. Pablo Sandoval looks like he went from eating salads to eating buckets of Twinkies over the offseason. Nobody wants Hanley Ramirez to play first base. Or third base. Or left field. The Red Sox finally got a legit ace for the first time since Jon Lester jetted to the Chicago Cubs. They traded for flame throwing closer Craig Kimbrel to shore up their bullpen and to put less stress on Koji Uehara who is 40 years old. Everyone is expecting Mookie Betts and Xander Bogaerts to have great seasons and become top performers for this club. Oh yeah, and there’s this Travis Shaw guy that everyone is talking about because all he does is rake like he went to a vocational school for horticulture. 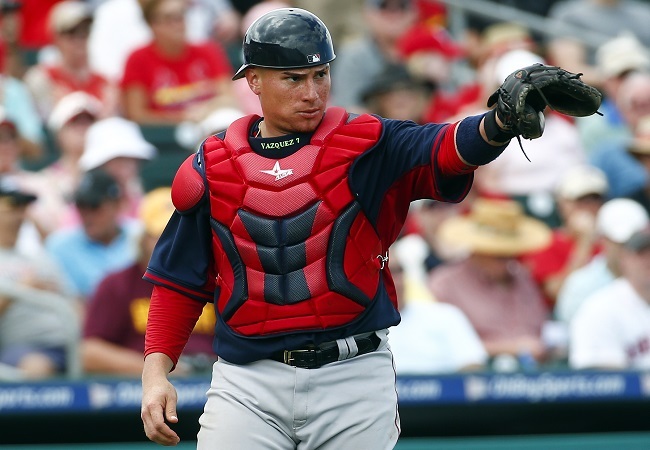 The Red Sox have also been looking for a steady catcher that can handle the pitching stuff while holding his own inside the batter’s box since Jason Varitek retired in 2012. I believe that man is Christian Vazquez. You probably haven’t been hearing much about Christian since he had Tommy John surgery and missed the entire 2015 season, but he is only 23 years old and has a bright future ahead of him. Vazquez is a catcher that truly cares about his craft. He is always working with pitchers and finding out how they like to pitch to certain hitters and learns their strengths and weaknesses. One of his biggest strengths is something that Red Sox fans haven’t seen in a very very very long time and that is that he has absolute freaking laser beam for an arm. He has a 52% caught stealing percentage. Granted it’s only through one season but there’s no doubting his ability to gun down base runners like Jamie Foxx in Django Unchained. When it comes to hitting, the jury is still out. He batted an unimpressive .240 with 1 HR and 20 RBIs in 201 plate appearances. But, with the loaded lineup that the Red Sox have now, he can bat 9th and figure it out as the season goes on. As long as he performs like we all know he can behind the plate then nobody will mind. Hell, I think he could be the X factor for the Red Sox this season if they plan on making the playoffs and making a serious run at the World Series crown. He could throw championship t-shirts from the duckboats while Pablo eats buckets of cannolis and we’ll all be happy.